Covington township was formed from the township of Tioga, and originally contained the territory now chiefly composed of the township of Bloss and Blossburg Borough, Sullivan and Mainesburg Borough, Ward and the borough of Fall Brook, Union, Liberty and Morris. 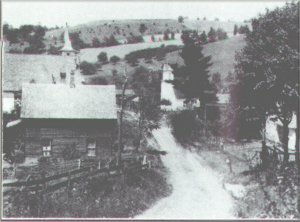 The earliest settler in the township was Aaron Bloss, who located in the township in the year 1801, and subsequently removed and founded Blossburg, five miles further up the Tioga river in the year 1806. The next early settlers were David Clemmons, Hovey, Washburne, Mallory, Sackett, Levi Prentiss, John Patten, Tilley Marvin, J. Coonrod Youngman, Asahel Graves, Absalom Kingsbury, Isaac Walker, Peter Keltz, Sumner Wilson, Robert Searles, Samuel Negley, Christopher Huntington and Nathaniel Elliott. The first assessment made by Ichabod Rowley to the county commissioners John Knox, Asa Mann and Elijah Depuy, when Covington contained the territory now embraced in some nine townships and five boroughs, showed the following list of taxable inhabitants, David Austin, Samuel Aldrich, Ebenezer Burley, David Burley, Alpheus Button, Joseph Bunn, Rufus Butler, Aaron Bloss, Gideon Briggs, Abner Cockran, Henry Campbell, John Cochran, Elijah Clark, Seth Clark, David Clemmons, Stillman Cannon, Samuel Campbell, Levi Elliott, Eli Gichell, Aaron Gillett, Charles Gillett, Asahel Graves, Josiah Graves, Levi Gifford, Noah Gifford, Samuel Higley, George Higley, Timothy Higley, Christopher Huntington, S. Huntington, John Keltz, Peter Keltz, Henry Knowlton, Absalom Kingsbury, Daniel Lamb, Henry Lamb, Gad Lamb, Minnard Lawrence, John Levergood, Silas Lamphear, Erastus Lillibridge, Jacob Miller, Richard Miller, George Mateer, John Marvin, Asa Mann, Samuel Negley, Thomas Overton, Elias Pratt, Rufus Pratt, William Patten, Levi Prentiss, Thomas Putman, Elijah Putman, Nathan Rowley, Nehemiah H. Ripley, Ichabod Rowley, Cephas Stratton, Thomas Sampson, Joshua Shaw, Amos Spencer, L. H. Spencer, Ichabod Smith, John Shaffer, Jonathan Sebring, Nathan Whitman, Isaac Walker, Archelius Wilkins, Daniel Wilkins, Tilley Marvin, David Harkness, David Harkness Jr., Royal Walker, Lorrian Lamb, Seneca Stratton, William Merritt. Sullivan township was taken from Covington township in the year 1816, and returned to the county commissioners its assessment to them, by their assessor, James Gray, Jr., at the same time as Ichabod Rowley did that of Covington and that is the reason why the names of the taxables of the whole township of Covington as embraced in the above list does not appear. By referring to the list made by the Sullivan assessor, the reader will obtain a complete list of the taxables then (1817) in the territory now composed of Sullivan township, Rutland township, Mainsburg borough, Roseville borough, Fall Brook Borough, Blass township and borough, Hamilton, Ward, Union and Liberty townships. --The Tioga and Elmira State Line Railroad runs across the township about centrally. --Victor Gray, one of the first engineers on the Corning and Blossburg Railroad resides in the township of Covington. --David Clemmens, a native of Hampshire County, Massachusetts, settled on the west side of the Tioga River in Covington township, in 1806. --The early settlers on the Elk Run road were Alonzo Reddington, Jonathan Jennings, Isaac Bliss, father of the evangelist and Asahel Graves. --Covington township is bounded on the north by Richmond township, on the east by Sullivan and Ward, on the south by Hamilton and Bloss and Blossburg borough and on the west by Charleston. --Asahel Graves settled in 1817; Tilley Marvin in 1817; Sumner Wilson in 1818; Ephraim B. Gerould in 1822; Richard Videau in 1831; David Caldwell in 1836; John Copp, a native of Rhode Island was the first settler in "Copp Hollow." --Settlers on the state road west of Covington borough were Norman Rockwell, Avery Gillett, Levi Elliott and Nathaniel Elliott. Matthew Skelley about forty-five years ago settled on the west side of the Tioga River; in the eastern portion of Covington the early settlers were Lyman Frost, James T. Frost, Samuel and Lewis Walker, Joseph Jacques, Peter Whittaker, Silas Lamphere, John Cleveland. Sumner Wilson and James Negley settled on the Williamson road about a mile and a half north of Covington Borough.